Now available for check out: the Internet! Borrow one of our mobile WiFi hotspots to get internet access on the go or at home. The easy-to-use, hand-held Library Hotspots allow you to connect up to 10 devices at a time with no limits on data. Place a hold on one now or read on for more information! How do I check out a hotspot? Stop by the Library or use your Library card to place a hold (search “hotspot” in the catalog) and check it out just like any other item. 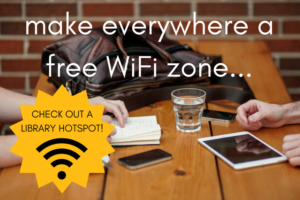 The hotspots can be checked out at the Pauline Haass Library only; they cannot be picked up or dropped off at other CAFE libraries. The Library also has 4 “Lucky Day” hotspots: these cannot be put on hold, so stop in to see if one is available! Who can check out a hotspot? Adult (18 & older) cardholders in good standing can check out a hotspot. Find more information on getting a library card here. Hotspots can be borrowed for 7 days. Overdue hotspots will have Internet access disabled. There is a $1.00 per day overdue charge. “Lucky Day” hotspots (non-holdable) can be borrowed for 14 days. Overdue hotspots will have Internet access disabled. There is a $5.00 per day overdue charge. No. You can place holds on the hotspots, but we cannot guarantee their availability for a specific date or time. Hotspots must be returned to a staff member at the Pauline Haass Library. You must return the hotspot with all parts (carrying case, charger, battery, coverage map). Please do not return in the book drop. Yes, hotspots can be renewed as long as there are no holds from other library users. “Lucky Day” hotspots cannot be renewed. More questions? Call us at 262-246-5181!